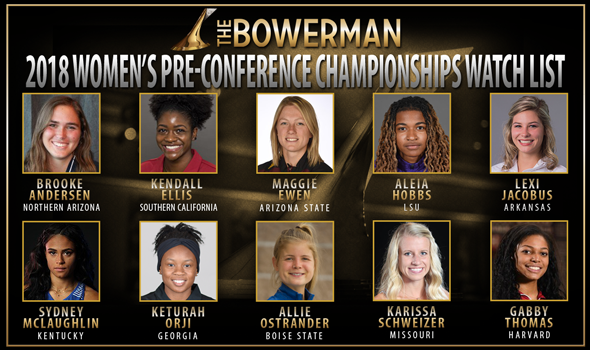 NEW ORLEANS – The 2018 Women’s Pre-Conference Championships Watch List for The Bowerman, announced on Wednesday by the U.S. Track & Field and Cross Country Coaches Association (USTFCCCA), has a little bit of everything. For those looking for big marks, the newest iteration of the Watch List features women who have had historic performances over the last few weeks. If one is looking for familiarity, one of the 10 women featured here made Watch List history with her inclusion. And for those hoping for a new name, there’s one of those in the fold, as well. Brooke Andersen RS SR Northern Arizona Throws Vista, Calif.
Maggie Ewen RS SR Arizona State Throws St. Francis, Minn.
Aleia Hobbs SR LSU Sprints New Orleans, La. Lexi Jacobus JR Arkansas Pole Vault Cabot, Ark. Gabby Thomas JR Harvard Sprints/Jumps Florence, Mass. Arizona State’s Maggie Ewen and Kentucky’s Sydney McLaughlin have put together outstanding outings since the last Watch List was announced to remain in consideration for collegiate track & field’s highest honor. Ewen became the first woman since Colorado’s Jenny Barringer – who captured The Bowerman in 2009 – to hold two or more collegiate records at once when she broke the shot put record this past weekend at the Desert Heat Classic. The product out of St. Francis, Minnesota, recorded a mark of 19.46m (63-10¼) to break Raven Saunders’ record set in 2016. Ewen also set the hammer throw record in early April at the Sun Angel Track Classic. McLaughlin lowered her own world junior record in the 400 hurdles at the National Relay Championships last weekend. The stellar freshman ran a 53.60, putting her in fourth place on the collegiate all-time list. Making Watch List history with her inclusion on the newest Watch List was Georgia’s Keturah Orji. Having graced the Watch List 25 times now, the jumper from Mount Olive, New Jersey, owns more appearances than any other female athlete in Watch List history. Orji last competed at the Mt. SAC Relays, where her triple jump mark of 14.33m (47-0¼) was the second-best performance in collegiate outdoor history. One woman made her debut on the Watch List in Northern Arizona’s Brooke Andersen. Going toe-to-toe with Ewen in the hammer throw at the Desert Heat Classic, the redshirt-senior from Vista, California, outthrew the collegiate record holder by nearly four feet, posting a mark of 74.20m (243-5) that stands as the second-best throw in collegiate history. Andersen became the first woman from Northern Arizona to be named to The Bowerman Watch List. Rounding out the pack were familiar names who have continued to add to their outstanding seasons. Karissa Schweizer of Missouri had a very strong few weeks since the last Watch List was announced. The native of Urbandale, Iowa, won the 5000 at the Drake Relays with the nation’s fastest time on the season at 15:23.21 – which also broke a 33-year-old meet record – while also helping the Tigers’ distance medley relay team finish first at the same meet. Additionally, Schweizer ran a 4:12.83 in the 1500 at the Tom Botts Invitational for the eighth-best time in the nation this season. LSU’s Aleia Hobbs anchored the Tigers’ 4×100 relay squad at the LSU Invitational that ran the fastest time in the nation this year. The New Orleans native helped the quartet post a 42.49. Kendall Ellis of Southern California was also instrumental in a strong relay performance. The product out of Pembroke Pines, Florida, ran the third leg of the Trojans’ 4×100 relay team that notched a 42.57 at the Mt. SAC Relays, good for second on the Descending Order List. Ellis also ran a 51.43 in the 400 at the Mt. SAC Relays, putting herself in fourth on the Descending Order List in that event. Competing at the National Relay Championships, Arkansas’ Lexi Jacobus won the pole vault event title with a mark of 4.51m (14-9½). The event title was Jacobus’ second of the season. Boise State’s Allie Ostrander remained on the Watch List after her outing at the Bryan Clay Invitational. The redshirt-sophomore ran a time of 4:15.06 in the 1500, putting her 13th on the Descending Order List. Rounding out the Watch List was Harvard’s Gabby Thomas, who helped the Crimson place second in a pair of relays at the Kansas Relays. The 4×100 squad notched a time of 46.22, while the 4×400 team hit a mark of 3:46.32. Thomas ran the second leg in each event. Three women also received votes for this iteration of the Watch List in Kentucky’s Jasmine Camacho-Quinn, San Diego State’s Ashley Henderson and Georgia’s Lynna Irby. The next Watch List will be announced on May 16.